Recorded in concert (Sankei Hall,Tokyo, Japan); July 14-15,1963. Alexander the Great, according to ancient legend, led his troops to victories over just about every known country at a very early age and then wept because there were no more worlds to conquer. While we are not going to suggest too direct a comparison, it is true enough that Cannonball Adderley has led his sextet (and before that, a quintet) through triumphant engagements in a great many clubs in just about every major American city. Several of these dates have also produced very triumphant record albums. And there have been, in addition, successful tours of many European countries, as the Adderley group has proceeded since 1959 to build and maintain a reputation as one of the best and best-loved jazz groups of our time. This would seem to have left this hand with very little more to accomplish. But Julian Adderley and his cohorts, despite being very soulful people, are not much given to tears. So, instead of weeping, they set out to find new worlds to conquer. It's still a bit early to attempt to he the first jazz group on the moon or Mars, but there was the relatively unexplored territory of Japan. Those few jazz headliners who had already been there (such as the hands of Art Blakey and Horace Silver) had reported that this was quite fertile ground. 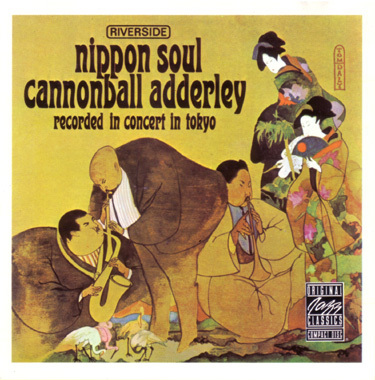 So it is scarcely surprising that the Adderley Sextet's first Japanese tour turned out to be a wild success. They drew sell-out crowds to concerts at Tokyo's Sankei Hall (roughly the size of Carnegie Hall), an achievement that reportedly had previously been accomplished only by another attraction of undoubted internationally-soulful appeal: Ray Charles. The Nipponese have in recent years shown an avid appreciation for many things of Western origin: clothes, base. ball, jazz (on one concert the Adderley musicians were joined by local players of startlingly well-developed talents). Considering the proven ability of this band to function at its best in front of an enthusiastic and aware audience, as has been demonstrated on more than one hit album, it would have been quite a waste indeed if this tour had gone by without being preserved on tape. Fortunately, the occasion was not to be wasted. Through the cooperation of Philips Records of Japan, obviously the possessors of equipment and engineering skills fully up to American standards, Sankei Hall became the scene of what is probably the first recording of American jazz artists in that country. There are also two "standards" or, more accurately, two works by outside composers. For, while many musicians have tackled Cole Porter's Easy to Love, which serves here as a vehicle for Cannon and drummer Lou Hayes, the otherwork is something else again. Come Sunday is one section of what Cannonball accurately describes as one of the most ambitious and significant of all jazz compositions, Duke Ellington's "Black, Brown and Beige" suite. Few, if any, groups would dare this one, but this Joe Zawinul arrangement which spotlights the pianist and bassist Sam Jones is a remarkably sensitive and moving success. The multi-talented Yusef Lateef contributed the other two selections. Brother John, dedicated to John Coltrane, manages not only to evoke the feeling of Trane's "bag", but also offers, in Lateef's fascinating performance on oboe, what can only be called a brilliant emulation (certainly not an imitation) of Coltrane's soprano sax work. The Weaver is a mean (in the best sense) blues on which everyone wails mightily. The Japanese audience is definitely a part of the proceedings, though not in the whooping-and-hollering way that an American crowd might be. Rigorously silent during solos (but not, the musicians point out, with the quiet you get when an audience is not with you and is "sitting on their hands" you could always feel them out there), they burst forth at the end of a selection in a most dramatic contrast. "And the way they line up for everyone's autograph after a concert," Sam Jones informed us, "makes you feel like a movie star." Add it all together: the unique setting, exceptional material, and top.of.their-form playing by this spirited and (quite literally) internationally acclaimed sextet. The result, to return to our original thought, is certainly not anything at all for anyone to weep about!